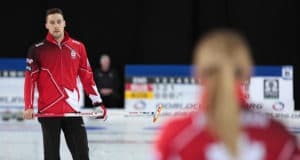 Alberta’s Darren Moulding, with teammates Heather Jensen (his sister), Brent Hamilton and Anna-Marie Moulding (his wife) of the Coaldale & Airdrie CCs, has earned the bye to the championship final at this year’s Canadian Mixed curling championship at the Rideau Curling Club in Ottawa. 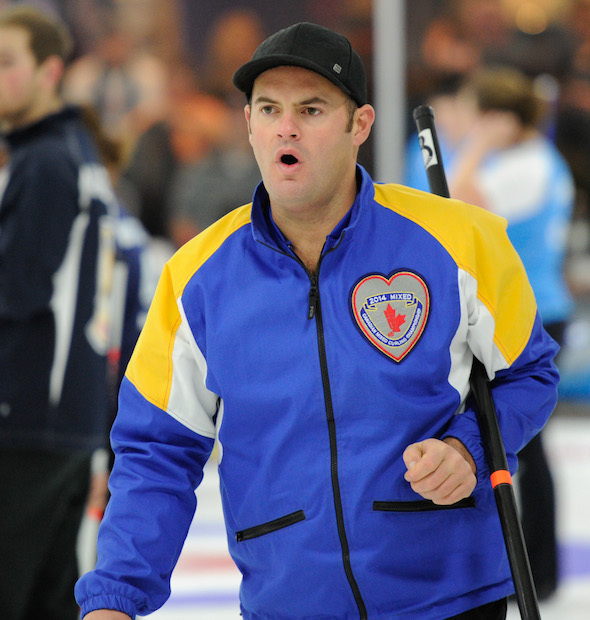 Moulding was scheduled to play Newfoundland/Labrador’s Gary Oke in his final round-robin game, but Oke was unable to play due to illness. Local player Don Bowser from the alternate pool was asked to fill in at skip, and what a job he did on behalf of the Corner Brook team before ultimately falling short 8-5. Newfoundland/Labrador scored two in the first end, then stole a single in the second end. Moulding replied with three in the third to tie it up, and then stole a pair in the fourth to surge ahead. 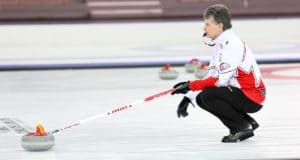 The teams traded singles in the fifth and sixth ends, and the 7th was blanked when Bowser made a long raise-double takeout to prevent two and possibly three points for Alberta. Bowser took a single in the eighth with a nice draw to the four-foot to pull within one, and Moulding blanked the ninth. Alberta was in some trouble in the 10th until Jensen, one of the hardest throwers in women’s curling, double-peeled a pair of guards and kicked the Newfoundland/Labrador stone to the eight-foot from the four-foot. From there it was routine for Moulding, who punched his ticket to Saturday’s 2 p.m. ET title game with a 9-2 record to complete the round robin. Whom he will face in that final is still up in the air. Saskatchewan’s Shaun Meachem will play Northern Ontario’s Charlie Robert in his final game Friday morning. A win will also place him at 9-2 and nail down a berth in the semifinal (Alberta takes first based on its round-robin win over Saskatchewan). A loss in the morning will still guarantee him a spot somewhere in the playoffs, all pending key games in the morning between Ontario and the Northwest Territories, while New Brunswick plays Newfoundland/Labrador. Wins by either or both of Ontario (7-3) and New Brunswick (7-3) will land them in at least a tiebreaker, while losses by both teams could bring Quebec (7-4) and possibly Nova Scotia (6-4) back in to the picture. Rob Harris’ Halifax foursome dimmed the hopes of Quebec’s Mike Fournier, who needed a win to be guaranteed a spot somewhere in the playoffs. Harris controlled the entire game from the first end with an opening deuce en route to beating Fournier 7-6. 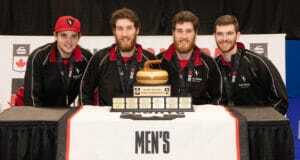 Harris must still defeat Manitoba’s Sean Grassie Friday morning to get to 7-4 and then hope for a couple of upsets. In other games Thursday night, P.E.I.’s Rod MacDonald finished his round robin at 5-6 with a 9-5 win over the the Territories’ Steve Moss. Moss’s record is 2-8. Northern Ontario, meanwhile, turned back B.C.’s Keith Switzer 7-5, dropping B.C. to 2-9 for the week. Robert is at 4-6. Teams with the evening byes were: Saskatchewan (8-2); Manitoba (4-6); New Brunswick (7-3); and Ontario (7-3). Alberta finishes first overall and advances to the championship final while the second-place team will meet the third-place team in the semifinal. Round-robin games will conclude Friday morning. The semifinal will be played that day at 7:30 p.m. with the Championship Final at 2 p.m. on Saturday3.